Product prices and availability are accurate as of 2019-04-18 06:08:37 UTC and are subject to change. Any price and availability information displayed on http://www.amazon.com/ at the time of purchase will apply to the purchase of this product. 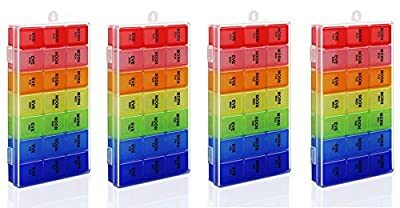 The Rainbow Weekly Pill Organizer with Snap Lids is a wonderful way to organize and keep track of all of your dog's medications and supplements. This colorful organizer comes with an outer storage case with seven detachable compartments, each with three smaller compartments for various times of the day-- morning, noon and night.